← On the pervasiveness of communication. 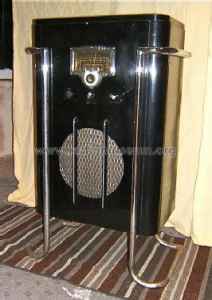 I thought I’d start the weekend off with some more photos of butchered antique radios for your viewing misery pleasure. This is the second-round photo roundup. Check out the first set of ruined antiques here! 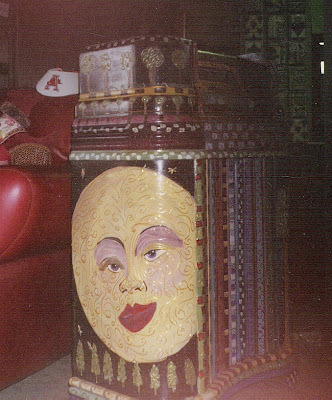 An aspiring artist thought this 1940s Philco radio would look better painted in a motif reminiscent of Starry Night. I don’t really agree. 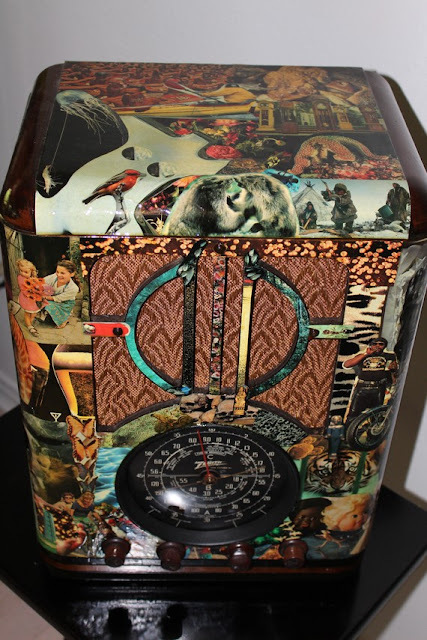 Somewhat similar, a dealer is selling a Zenith tombstone radio that’s been decoupaged with magazine clippings. This was almost an interesting work of art, but because the magazine clippings aren’t from the correct period, it’s just tacky. 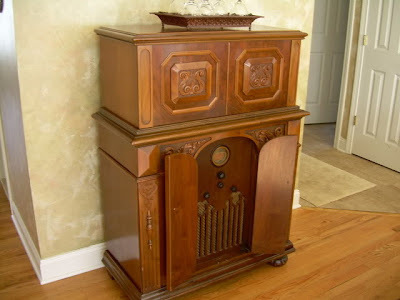 This late ’20s lowboy radio was stripped down into an end table. Cleanly done but it would’ve been more interesting with the internals, even non-working. 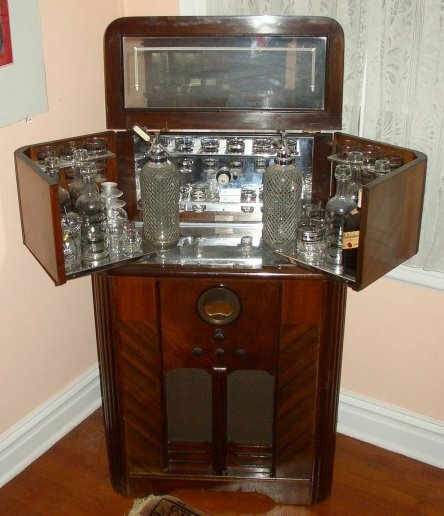 From Craigslist, someone turned what I suspect is a late ’30s RCA into a bar with a modern stereo built in. 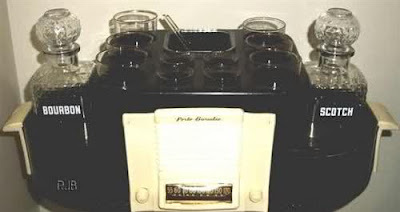 Turning radios into bars seems to be a popular thing to do with them. 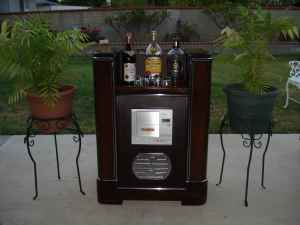 Radio bar conversions have been going on for a very long time – almost as long as radios have been around – and some can be very interesting. 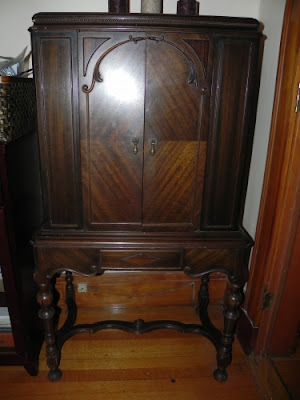 It’s just that many are done without respect for what the radio used to be – and without regard for the shape of the cabinet. 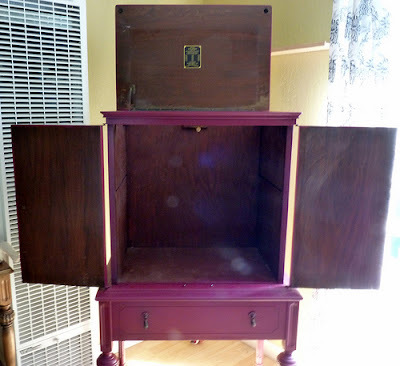 Most upright radios don’t have a flat inside space to place anything, making shelving difficult – and ensuring that it’s going to look ugly no matter where it’s stored. 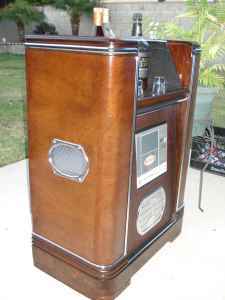 If you’re looking for an antique radio bar, you might be better off shelling out for an authentic one rather than a conversion. 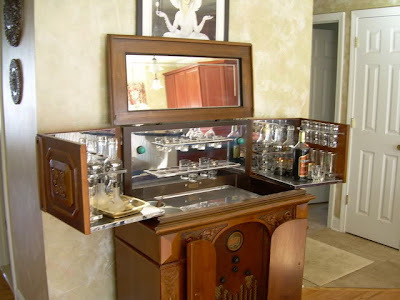 While it might look at first glance like a 1930s RCA radio that’s been painted black and had 1970s chair rails stuck on the ends, this is in fact an original by famed industrial designer and RCA contributor John Vassos and is worth thousands. Its style is the sort of thing that could be easily overlooked, too! 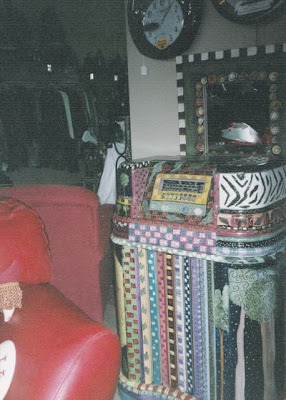 This entry was posted in Collections, Commentary, Photos, Radios and Tubes and tagged antique radio, decoupage, john vassos, philco, photo, porto-baradio, radio bar, rca, ruined antiques, shabby chic, stereo, tasteless, tube radio, zenith. Bookmark the permalink.